I spend far more time looking at photos of women in public life than I do those of celebrities. Women politicians must look professional and polished during 12-hour or longer days, from informal breakfast meetings to state functions, and often while traveling—what a brief! 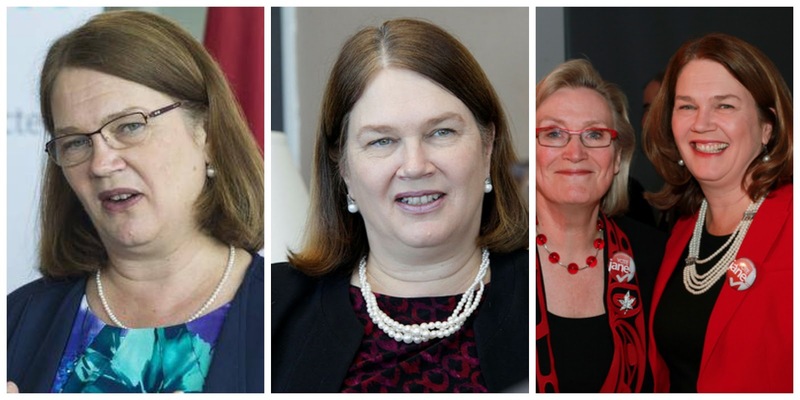 We have recently welcomed a record number of Canadian women federal government ministers, and a number rely on pearls to polish their hardworking wardrobes—with mixed results. I don't think pearls correlate to performance, but because these women are photographed while they work, it's a good way to see how to wear such a popular piece of jewellery. The Hon. 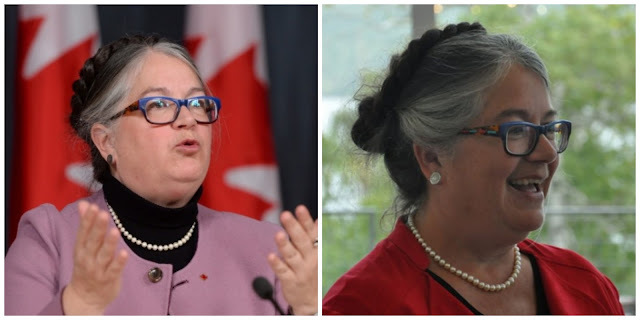 Diane Lebouthillier, Minister of National Revenue, wears an average-sized classic single strand often. At left, the pearls look unprepossessing on the substantial turtleneck; a better choice would be a brooch at the shoulder, or earrings with presence. If you want to wear pearls (or any beads) with a high collared knit, go big. And what are those earrings? Probably not the brown rabbit droppings they look like. OK, Mme. 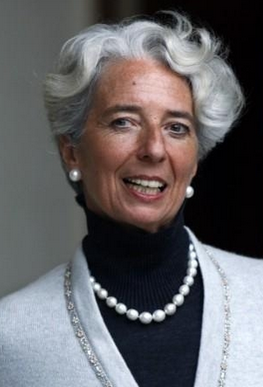 Lagarde's are ginormous South Seas, but even good costume would be acceptable. Dr. Carolyn Bennett, Minister of Indigenous and Northern Affairs, travels to the most remote areas of this vast country, most recently to meet with parents of murdered and missing indigenous women. 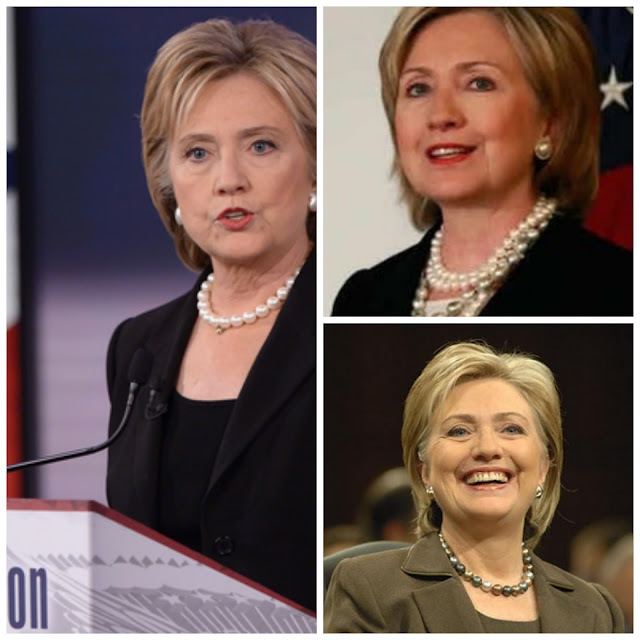 She wears pearls well, and when she ups the size at neckline of her white blouse, as in the right photo, they're far more striking. The Minister of Health, Dr. Jane Philpott, is, like Bennett, a physician turned politician. Her pearls are the smallest, and the ones I would most like to replace. They are not up to the demands of life on the podium, a mismatch to her significant role. At left, a necklace that I suspect was a sentimental gift some time ago, but now too small for a grown woman. The middle one looks sloppy. To replace those, I'd suggest this pretty pearl torsade from Ross Simons, for a most reasonable $125, just what the doctor ordered. The five-row necklace at right is a better scale for her, but is askew. Every woman can wear pearls, but they should be the adult version, and if you can't be bothered to arrange them, choose a symmetrical piece. I'd also like to see women in the spotlight choose more striking designs than the round whites. 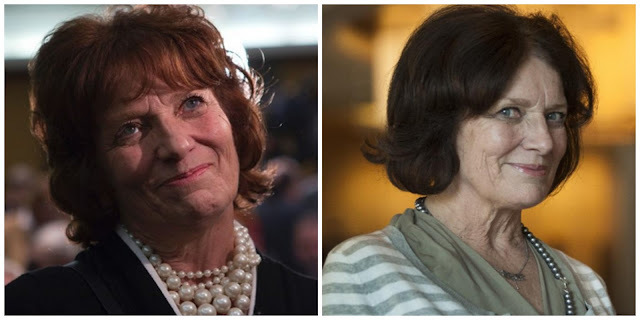 Margaret Trudeau, mother of our current Prime Minister, wife of a past one, wears pearls marvelously. 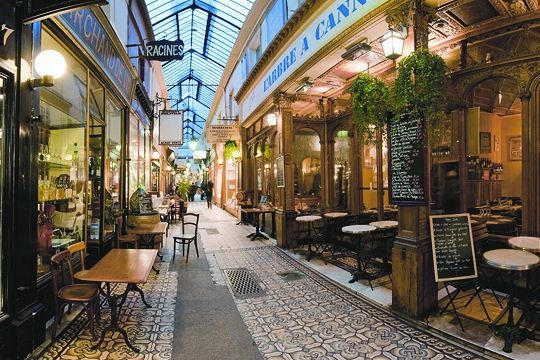 She chooses modern pieces, mixing sizes or adding a pendant. Below, the shot at left shows how smaller pearls can be worn with larger. The pearls on the right are of medium size, but the grey colour, decorative clasp and second delicate piece add visual impact. If they are well-chosen, pearls add elegance and polish without demanding much attention or thought. 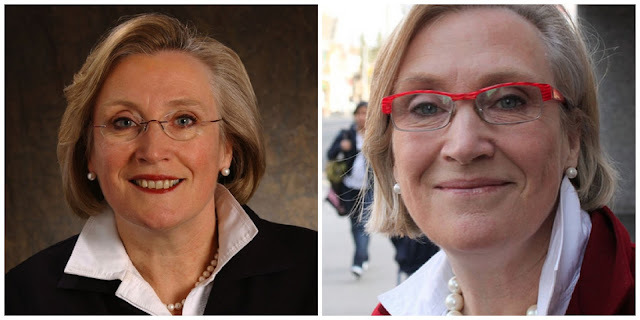 Our Canadian ministers are on the right track, but a few could use a pearl makeover. Do they need a role model? One of the most recognized political figures of our time wears pearls frequently, and ventures beyond round whites: grey coins, a fab mother-of-pearl bib, and large whites accented with decorative spacers. But for the world-stage moments, she chooses important pearls. 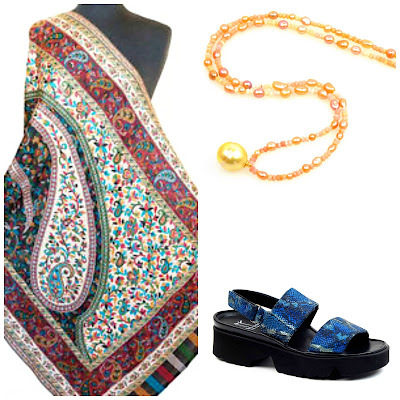 She wears at least two South Sea strands that she may mix with multicolour Tahitians or a delicate pendant. Their effect is undebatable—so Hillary Clinton wore them to hers. Rabbit droppings? really? That's just being a mean girl. You are generally so much more constructive in your comments. I cannot bring myself to have my original small pearls remade into something more upbeat...but I do have several strands of larger ones, longer ones and multi coloured, grey and so I mix them up...Christine, Hilary and Margaret get my votes for their pearls! I didn't think of geeky scientist turned world leader Angela Merkel as being as pearly as either Lagarde or Clinton, but did turn up some good pearly pics googling Angela Merkel pearls. I thought the "rabbit droppings" bit was funny, but in my housing co-op we've been laughing about my tiny black cat Livia's supposed "rabbit droppings" as those of us who have pets are on stool patrol in the back garden. They illuminate Margaret Sinclair-Trudeau's face - she went through some rough periods (mental health issues) and they have marked her beautiful face more than I would have expected in her cohort and class. She seems very happy now. These photos are great illustrations of points you've made in past pearl posts. They really help me see the difference the right size and style can make. Thanks as always. 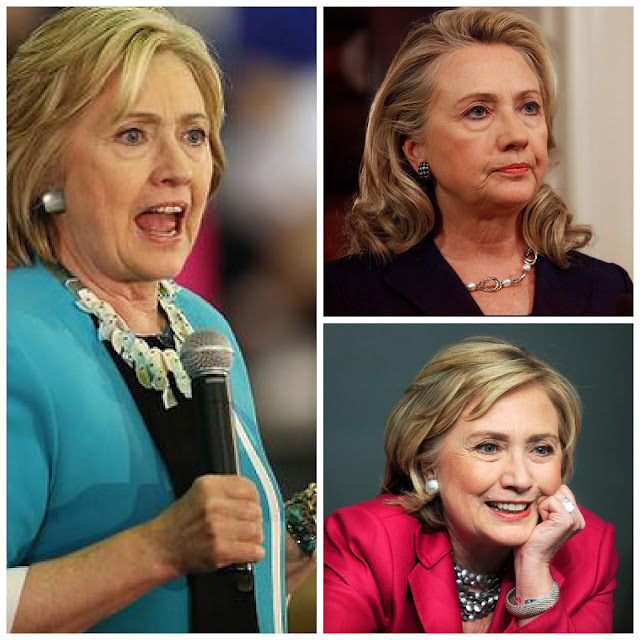 Love Hillary's big whites with spacers, a really lovely design. Kristine Barge: I can see how a rabbit might be offended. hostess: Might you perhaps mean "updated"? 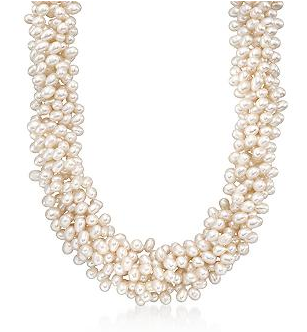 Small pearls can be upbeat, if the style is current. lagatta: Yes, I like her face's lived-in quality too. As Joan Holloway said in Mad Men, "You want to be taken seriously? Stop dressing like a little girl." My 18 year old daughter, who I fully expect to rule the world sometime in the future, has worn nothing but pearls for the last 2 years. She has my mother's good pearls and her lovely boyfriend gave her some Tiffany pearls. (She's a lucky girl and very very smart. Obviously knows how to choose a boyfriend!) Assorted sizes of pearl studs adorn her ears. Welcome back! I've missed you terribly. Once again, you get right to the heart of the matter and make your case with illustrations that one can't really argue with. After a certain age, bigger is definitely better. I had totally forgotten about Margaret Trudeau. She was a beautiful young woman (and her face aged great) and, as we say a "Wilde Hummel". Didn't she have an affair with Mick Jagger? 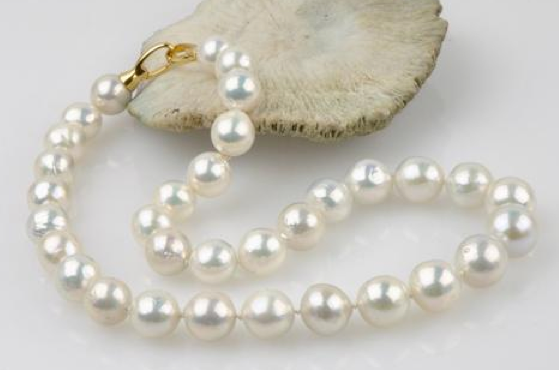 Nelson Bartely: Your daughter's pearls sound as beautiful as sentimental. In general I advise women (or those who gift them) to look at vendors that sell beautiful pearls without the premium attached by prestige jewellers. The reason is to put pearls within reach for more women, and to maximize a budget. But I would not refuse a certain blue box that contained a strand, if they were big enough. Barbara Schieren: Ms. Trudeau has written several three memoirs to date, but it is Keith Richards' autobiography "Life" that supports the Jagger rumour. I love pearls and very much appreciate this post - it will help me make some better choices in future. I'm new to your blog, and I wonder: have you ever addressed the sustainability of pearls? As oysters are filter feeders that make the water cleaner, I would guess that pearls are a highly sustainable choice, with good environmental outcomes. Just another reason to love them! How each country and even each producer treats its environment will differ. "The more money and attention that is paid to pearls, the more likely the farmers are to ensure clean waters for their animals. Pearls are the ONE and ONLY gem in the entire jewelry industry that is actually GOOD for the environment..."
A person once commented here that pearling "exploits oysters". If one is averse to using animal products, pearls will not desired. However, in comparison to mineral mining, the "exploitation" is not comparable- but some people hold that view. I love my pearls, I have 2 real strands, but mostly I have "fearls" or fake actually, and layer them together and sometimes with a textured gold chain. I've had people tell me it's my signature look! And I wasn't even trying! Thank you for this well-considered response- informative and much appreciated. I will add Kamoka to my wish list. Really enjoying your blog from here in Vancouver! Amie: IMO massed pearls as you describe provide a real effect without them "wearing you". With so many reasonably-priced freshwater pearls on the market, perhaps you might •gradually• move into wearing more genuine pearls? Genuine pearls of good to very good quality (not necessarily the finest) offer under and overtones you do not see on fakes. They do something to your skin that fakes- however fun they are- can't. That's because that deep glow, supplied by the pearl's nacre, is not satisfactorily duplicated via coating glass or plastic beads. Of course there are low-quality genuine pearls too... hang around here and you'll know the difference. Jill: Thanks, I should write an entire post on that. When I'm looking at the pictures of the too "small" scale pearls, I clearly see the need to scale up in size. I've been looking online for a more substantial strand. What size range is more adult? I can't really tell from the examples. I'm in scientist mode, what is considered "average" size? Would a 16" necklace of natural blue akoyas 9.0-9.5 be too small? Opinions requested please. ckaspar: Sorry to give you an it depends answer, but it does. Depends on your stature, and your build. A petite, thin woman can wear smaller pearls but I would not go beneath 9mm even then. For a woman with a bosom, wider shoulders and a neck that is average to largeish, I'd hope to move to 10mm at least. If you have accustomed to smaller pearls, such as 7.5-8mm, even a 1mm increment may seem big- but that is a short-lived illusion. Go larger than you are •quite• comfortable with, because you will regret too small. Inhabit your scientist's splendour! If you are shopping online and want an opinion, contact me via e-mail- on right under my photo. But in the end, you are the one who must be delighted. Blue akoyas are exquisite pearls. Thank you so much. I've been obsessing for the past 2 weeks. But my instinct says that you are correct. I am kind of tall, 5'9" and add 2-3 in heals...well, I see your point. This is the start of my long over due adult pearl collection! ckasper: (We are same height, now that I've lost an inch.) If you are considering several of the better-known online vendors, they have very good return policies (usually 30 days and full refund), so you could try different sizes. Some of the vendors will also send you neck shots on request so you can see them on a person which helps. 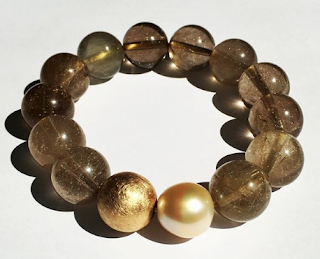 Casper: I know those are gorgeous; I have a similar strand from Kojima, bought 7 or so years ago, and when I wear them jewellers (and women( want to know where I found them. Please do let me know about the earrings, too. Enjoy every glowy minute in them!